I was baffled as how to approach this double-CD. For a start, Entangled States consists of 48 separate, short piano pieces: all are untitled save for their roman numerals. The entire work lasts seven minutes shy of two hours. It seems a long time to concentrate on music that does not have an obvious structure. There are other difficulties: the liner notes consist of 10 pages of densely, but not necessarily opaquely, written text, some by composer Scott McLaughlin and a performer’s perspective by Mary Dullea. It calls for profound study, not a quick glance. Furthermore, it is not possible to get a handle on the composer. The only biographical information is a short note by Stephen Sutton: there is no webpage devoted to Craven’s music, although he does maintain a blog. The only details that listeners have is that he taught maths and music in his home town of Manchester and has composed music since his teen years. Craven is cagey about revealing his date of birth and doesn’t. The composer has admitted that he is a musical recluse: he has written that he likes “to work in isolation without reference to, or connection with, any other musicians”. Yet clearly this is not the whole truth. He has need of the sound engineers to record, the advertisers to market and the present pianist, Mary Dullea to ‘realise’ his music. What has Eric Craven written over the years? Who knows. Certainly, his blog does not (seem to) tell us. There have (I think) been only two previous albums of his piano music: Piano Sonatas and Set for Piano. Eric Craven’s compositional technique needs understanding. He has devised a procedure which he has called ‘Non-Prescriptive Compositional and Performance Techniques’. Basically, it is a kind of ‘aleatory’ method that allows the pianist (or realiser) to have a greater or lesser control over the work. Clearly this will result in varying performances each time the work is played, whether by the same or by a different pianist. This procedure is not new. However, Craven has further developed this method. I self-quote from my previous review: “His take on this form has given rise to three levels of ‘Non-Prescription’. The ‘Lower Order of Non-Prescription’ sees pitch, rhythm and duration committed to the manuscript paper. The performer is free to decide on tempo, dynamics, phrasing, pedalling and the articulation of the notes. Then there is the ‘Higher Order of Non-Prescription’ where only the notes are given. Interestingly this is effectively a ‘pitch set’ where the notes can be played at any octave above or below the notation. Additionally, these ‘sets’ can be grouped together ‘vertically to form chords or clusters’ – ‘harmony.’ Formally, the music can begin or end at any point in the score. To confuse the issue further, there is also a ‘Middle Order of Non-Prescription’ where ‘short musical fragments with pitches and rhythms are left disconnected and free-floating on the page with no implied ordering’”. Clearly, this results in a work that is a joint product between composer and pianist. But where does the boundary lie? How much of the creative process on this CD is in the hands of the pianist? I guess that if there were ever to be a second and a third recording of Entangled States they would be widely different in sound and execution. Is that a good thing? In the context of Craven’s musical philosophy, the answer is Yes! The reader will be delighted that I am not going to write a paragraph or two on each of the 48 numbers in Entangled States. Just one or two brief, general observations. Firstly, the liner notes explain that these pieces can be played in any order. Secondly, there is a list provided relating the ‘Low, Middle and Higher Order of Non-Prescription’ to each piece, allowing the listener to have a clue as to the extent of the input from Marry Dullea. Remember ‘High’=’Pitch Only’…! And finally, most important of all, what does this music sound like? It could be described as Kaikhosru Sorabji having cocktails with Bill Evans, Count Basie, Claude Debussy and Igor Stravinsky. This is a sweeping stylistic simplification, but it may help. The music is not difficult, it is typically comprehensible to the listener and nearly always pleasing to the ear. The sound quality is excellent, the playing is impressive, ‘inventive’ and dynamic, although we have nothing to compare Mary Dullea’s performance with. Everything tells me that this is an ideal ‘wrap’. I commented on the liner notes above. Finally, I come back to my original point. 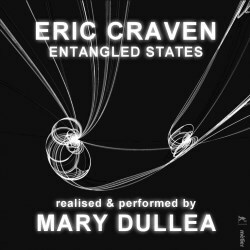 How much does this recording of Entangled States owe to Eric Craven and how much to Mary Dullea. Do I care? Not really... This is an impressive and often quite beautiful production. Just don’t allow the musical philosophy of the piece to detract from your enjoyment of the work.